On 19th October 2016, Catherine Green, Josephine McGread and Shane Rooney attended the National Guidance Forum meeting which took place in The Clock Tower DE&S. This is a biannual meeting hosted by Jennifer McKenzie NCGE. The two guest speakers were: Julie McCafferty European Project Manager Ballymun Job Centre, and Natasha Kinsella Regional Skills Forum Manager Dublin. Both input are available on NCGE web site. Julie gave a presentation on the 4 modules of training they have developed for Guidance Counsellors, these were developed from case studies from different European Projects. Natasha Dublin Regional Skills Forum Manager (RSF), give an update on her work in Dublin following discussion from participants at this meeting Jennifer has agreed to give Natasha a list of all Guidance service available and Natasha will have distributed these to her colleagues. We also explored how to get Guidance Counsellors onto the RSF boards and who is the most appropriate person to represent guidance at RSF. The discussions from the floor highlighted the need to work more closely with employers especially in our local area. Employers need to be informed on the NFQ and how QQI L1-L6 in many circumstance leave students ready for employment. We were all encourage to make contact with our local Skills Manager as an effective networking person. Other questions discussed were, active inter agency, how is networking being done. Jennifer McKenzie give an update on NCGE and introduced 3 new staff members, including our own previous staff: Mary Stokes and Liz Gannon. Jennifer highlighted the fact that the Role of Guidance Counsellor will differ depending on the client when looking at the level of skills of the client. Guidance Counsellors are doing guidance differently depending on the needs of the client. This meeting provided the opportunity for us to network with people in the room, such as Betty McLaughlin and Eddie Mc Grath from IGC, Clare Mc Mahon ETBI, staff from DCU, Trinity NUIM DSP QQI and other statutory bodies. We got the opportunity to share informally our concerns for AEGAI. The aim of the National Forum on Guidance is to exchange information and explore possibilities for co-operation and co-ordination across a lifelong guidance from work between the various guidance providers. 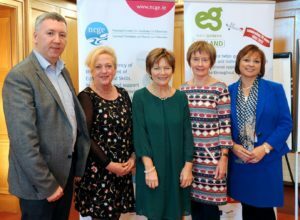 At the Guidance Counsellor’s Forum October 2016, Shane Rooney Chairperson Executive AEGAI, Josephine McGread NWAEGS Regional Representative on Executive AEGAI Catherine Green Vice Chair Executive AEGAI, Mary Farrell Adult Guidance Counsellor and Betty Mc Laughlin Chairperson IGC.